The lovechild of Aldo Gucci tells her story for the first time. The day of my father’s funeral, nothing felt solid beneath my feet. The earth had tilted on its axis and I hadn’t yet tilted with it. Misshapen by grief and pregnancy, I was twenty-six years old and less than a month away from giving birth to my second child when I watched his coffin carried into the church in Rome. His was the first funeral I had ever attended and the concept of his vital presence being contained inside a wooden box robbed me of what little balance I had left. Gripping my pew, I glanced at my mother, Bruna, sitting motionless beside me, her big brown eyes hidden behind huge sunglasses. She was so lost in her own desolation that she could offer me no solace. I felt like an orphan—and not for the first time. Truth was that she and Papà had lived in their own special world since long before I pushed my way into it. From the earliest days of their illicit romance in the 1950s, their bond was unfath­omably deep. I was the unexpected love child, sent by my father to be born in another country to avoid a scandal. Aldo Gucci, the creative visionary behind the famous fashion house, was not a man to be argued with. 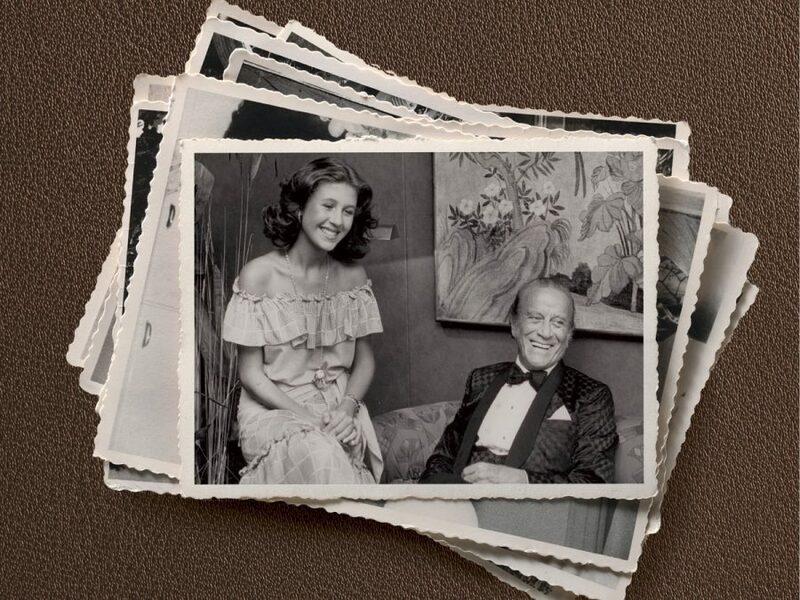 A trailblazing businessman of extraordinary dynamism, he’d transformed his father’s small Florentine luggage company into a global phenomenon that came to epitomize Italian chic. Then, in a catastrophic turn of events, I witnessed firsthand his heartbreaking downfall and the destruction of a family legacy he had fought so hard to uphold. During the last five years of his life a series of betrayals that brought to mind the tragedy of King Lear culminated in the sale of his business and ultimately led to his demise. To me, though, Papà wasn’t someone to be judged or pitied. He was just the handsome daddy with the ready smile and distinctive cologne who flew in and out of our lives with a blast of movement and noise like some exotic bird. Lanky, loose-limbed, and per­petually on the move, he’d arrive in a flurry to fill our still, silent spaces with his energy and laughter. A man like no other, he was human, vulnerable, and deeply flawed. Even though we never saw him often enough or for long enough, for Mamma and me he was the glue that bound us together. Now he was gone and we had his funeral to get through. Not only the hour-long church service but also an onerous three-hour journey to the Gucci mausoleum outside Florence. It would be an interminable day after a long and difficult few weeks. Mamma, Papà, and I had been holed up together at the private Catholic clinic waiting for the end—never quite believing it would come. As nuns glided silently to and fro, my mother had taken up her position on one side of his bed while I sat on the other. We were the keepers of secrets and the guardians of his truth—the two women who knew the real Aldo Gucci and who loved him anyway. The moment my married father first set eyes on “La Bella Bruna” when she went to work as a salesgirl in his Rome store, he lost his head—and his heart. The coy eighteen-year-old was to become my father’s true north and the compass by which he would plot the rest of his life. In the three decades when he criss-crossed the globe to build his empire it was to Bruna that “Dot-tor” Gucci—as he was often known—always secretly returned for succor and sanctuary. And it was she who clasped his hand as he died. The young beauty, whose looks had been compared to those of some of the most famous Italian movie stars of her era, paid a heavy price for being hidden away for all those years. And so—consequently—did I. A reserved child who’d had to grow up fast, I was mystified by my mother’s slow, sorrowful withdrawal from the world and the way she excluded me from their inner sanctum. Their remarkable history seemed to have been forgotten at the Chiesa di Santa Chiara on the northwestern fringes of Rome on the morning of his funeral in January 1991. My father’s chauffeur, Franco, drove us in silence to the modern terracotta- colored church. Joining the throng of mourners, we made our bewildered way up the sweeping stone steps and were ushered into pews alongside members of the staff and business associates who’d flown in from all over the world to pay their respects to the famed Gucci patriarch. Across the aisle sat my father’s first wife, Olwen, propped up by my three half brothers, Giorgio, Paolo, and Roberto, whose existence I’d been unaware of until I was ten years old. Never before had both families been together under the same roof and the atmosphere was chilling. It was also the first time I’d ever set eyes on their mother. If I’d thought about her at all, I suppose I’d imagined her to be an elegant, elderly Englishwoman, ramrod straight in twinset and pearls. Instead, she was a shrunken little old lady in a wheelchair and her physical and mental frailty at eighty-one shocked me. My mother, stiff with sorrow, didn’t even appear to notice. Nor did we register our marked separation from that side of my father’s family. This was our default position. On that bitter morning, in that unattractive building, all I could do was fan my fingers over my unborn child and wonder how we’d survive without my father’s protection from the family storms. He’d been gone for less than a week and although my mother still saw him every night in her dreams, we both felt utterly adrift. True to form, Papà had set his affairs in order long before he slipped into his final, fatal coma. He had organized his own funeral before entrusting the arrangements to his most devoted staff. It was to be a simple service with no flowers and few eulogies. Eager to pay tribute to my mother, he’d penned his own obitu­ary to be issued upon his death. Aldo Gucci, he wrote, left behind his wife Bruna Palombo and his companion Olwen Price. Some of the Italian newspapers faithfully printed the distinction between the two women just as my father had intended. There was no mention of my mother, or of me. It was a glaring omission, probably stage-managed by the other side of the family, but there was nothing we could do about it. Nor were we able to counter any of the other unwelcome things written about my father after his death. Legally, and for a long time, I was obliged to remain as invisible as others would have me and forbidden from divulging anything. Twenty-five years on, this is the untold story—my father’s, my mother’s, and that of the global empire he created that ultimately shaped all of our lives. It is now mine to tell. Excerpted from In the Name of Gucci: A Memoir by Patricia Gucci with permission from Crown Archetype. PATRICIA GUCCI was born in London and educated in England, Italy, and Switzerland before moving to New York to study acting. In 1982 she was appointed to the board of Gucci and roving ambassador in the United States and Asia until the company’s sale to Investcorp in 1987. She has three daughters and lives in Switzerland.